Résumé : The aim of this study was to evaluate the efficacy and safety of the intra-articular (IA) injection of botulinum toxin type A (BoNT/A) to the management of chronic pain in dogs. In a randomized, controlled, double-blinded study sixteen dogs with osteoarthritis secondary to hip dysplasia were distributed into two groups: 25 IU BoNT/A (BoNT) or saline solution (Control) was administered IA in each affected joint. All dogs received oral supplements (90 days) and carprofen (15 days). The dogs were assessed by a veterinarian on five occasions and the owner completed an assessment form at the same time (baseline to 90 days). The data were analyzed using unpaired-t test, Fisher’s exact test, analysis of variance and the Tukey’s test (P<0.05). There were no differences between groups in the veterinarian and owner assessments. Lower scores were observed in both groups during 90 days after IA therapy in the owner assessments (P<0.001). Compared with baseline, the Vet score was lower from 15-90 days after IA injection in the BoNT group, and at 15 and 30 days in the Control group (P<0.001). Both treatments were safe and reduced the clinical signs associated with hip osteoarthritis. However, IA BoNT/A (25 IU) did not provide better pain relief than the control treatment. Résumé : Objective: To assess the ability to visually detect fade during train-of-four (TOF) or double burst stimulation (DBS) in anesthetized dogs recovering from nondepolarizing neuromuscular block. Study design: Online anonymous survey. Population: Data from 112 participants. : Methods: A web-based survey containing 12 videos of the response to ulnar nerve stimulation with TOF and 12 with DBS obtained at different levels of recovery from rocuronium-induced block was distributed to participants of the American College of Veterinary Anesthesia and Analgesia and the Academy of Veterinary Technicians in Anesthesia and Analgesia email lists. Participants were asked to provide their highest training degree in anesthesiology, watch each video no more than twice, and determine whether fade was present. The probability to correctly recognize fade was calculated using binomial general linear models. General linear models and Tukey’s tests were used to assess the effects of level of neuromuscular block, pattern of stimulation, and observers’ training on the probability to detect fade. Results: The survey was completed by 53 diplomates, 29 licensed veterinary technicians, 24 residents and six doctors of veterinary medicine (DVMs). The probability to detect fade decreased as partial neuromuscular block became more shallow (p < 0.0001). A TOF or DBS ratio of 0.7 had a 50% chance of being detected. DBS was superior to TOF for detecting fade when the ratio was 0.3–0.69. TOF was superior to DBS when the ratio was 0.7–0.9 (p < 0.0001). There were no differences among groups of observers when assessing fade with TOF or DBS. Conclusions: and clinical relevance Detection of fade from observations of the response to TOF in dogs is unreliable. Advance training in anesthesiology or the use of DBS confers little to no advantage for this subjective test. Science, 2019, Vol. 363, Issue 6424, pp. 276-281Résumé : Pain is an unpleasant experience. How the brain’s affective neural circuits attribute this aversive quality to nociceptive information remains unknown. By means of time-lapse in vivo calcium imaging and neural activity manipulation in freely behaving mice encountering noxious stimuli, we identified a distinct neural ensemble in the basolateral amygdala that encodes the negative affective valence of pain. Silencing this nociceptive ensemble alleviated pain affective-motivational behaviors without altering the detection of noxious stimuli, withdrawal reflexes, anxiety, or reward. Following peripheral nerve injury, innocuous stimuli activated this nociceptive ensemble to drive dysfunctional perceptual changes associated with neuropathic pain, including pain aversion to light touch (allodynia). These results identify the amygdalar representations of noxious stimuli that are functionally required for the negative affective qualities of acute and chronic pain perception. Résumé : Alfaxalone, a synthetic neuroactive steroid, has been attributed with properties including sedation, anaesthesia and analgesia. The clinical relevance of any analgesic properties of alfaxalone has not been demonstrated. This study was a prospective, blinded, randomized, negative control clinical trial in 65 healthy dogs presented for ovariohysterectomy. Anaesthesia was induced and maintained, for Group 1 (TIVA) dogs (n = 30) with intravenous alfaxalone alone and for Group 2 dogs (n = 35) with thiopental followed by isoflurane in 100% oxygen inhalation. After ovariohysterectomy, quantitative measures of pain or nociception were recorded at 15 min intervals for 4 hr using three independent scoring systems, a composite measure pain scale (CMPS), von Frey threshold testing and measures of fentanyl rescue analgesia. The mean CMPS scores of Group 2 (THIO/ISO) dogs remained higher than Group 1 (TIVA) dogs from 15 to 135 min post‐surgery but this difference was not statistically significant. There were no significant differences between groups in the proportions of dogs requiring rescue fentanyl analgesia, the total fentanyl dose used or the time to first fentanyl dose. The Von Frey threshold testing was found to be unsuitable for measurement of pain in this experimental model. When administered as total intravenous anaesthesia, alfaxalone did not provide analgesia in the postoperative period. 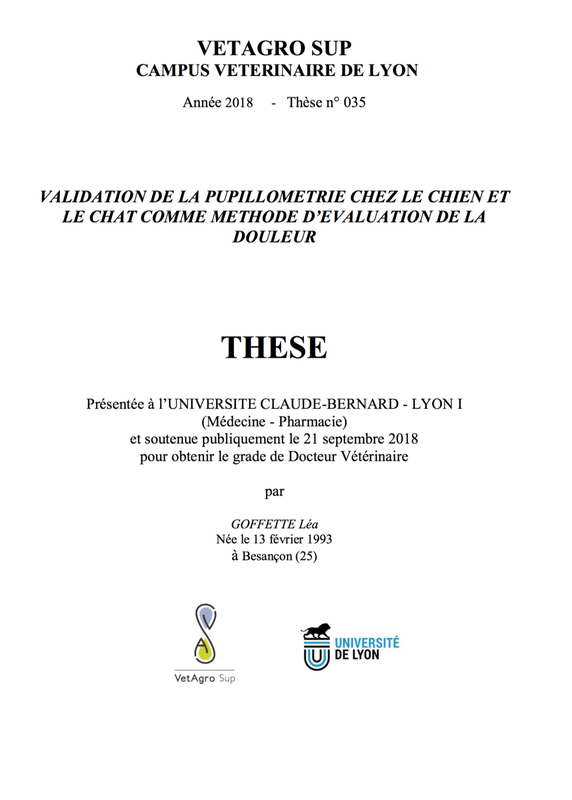 Résumé : L'objectif de ce travail était d'évaluer l'efficacité et la pertinence de la pupillométrie comme outil de monitorage de la douleur chez le chien et le chat présentant une affection douloureuse, hospitalisés en soins intensifs. Une étude prospective observationnelle a été réalisée au sein du service d'urgences et de soins intensifs de VetAgro Sup, Campus Vétérinaire de Lyon entre juillet 2016 et juillet 2017. Elle a permis d'inclure 9 chats et 27 chiens présentant une douleur évaluée à l'aide de la grille 4AVet par le même opérateur. Trois groupes ont été réalisés : un premier groupe constitué de 17 chats sains permettant d'avoir des valeurs de référence pour la pupillométrie, un deuxième constitué de 9 chats malades, un troisième constitué de 27 chiens malades. Ces deux derniers groupes ont permis d'étudier les variations des paramètres cliniques, paracliniques et de pupillométrie avant et après l'injection de morphiniques, analgésie s'inscrivant dans le protocole de soins de l'animal hospitalisé. Les travaux entrepris ont permis de montrer que la pupillométrie était une technique bien tolérée par tous les animaux. Toutefois, chez le chat, les résultats démontrent une variabilité dans les mesures, ce qui explique que son utilisation peut être plus difficile que chez le chien. L'étude a permis de mettre en évidence, dans l'espèce canine, que le paramètre de pupillométrie pertinent était le diamètre pupillaire : il diminue de façon significative lorsque la douleur augmente. En conclusion, la pupillométrie est une méthode pertinente et objective de l'évaluation de la douleur, facilement utilisable en médecine vétérinaire canine et féline.